I am a big fan of tomatoes, in any shape or form, and I’m always looking for new varieties. With fresh summer tomatoes gone by now, the next option is to check which hothouse tomatoes are available at the store. When I saw the brownish-dark red Kumato tomatoes, I had to give them a try. I later learned that they are a hybrid from Spain, have firm texture and sweet, juicy taste. I used them a couple of times in salads, combined with other types of tomatoes and vegetables, where they added their special color and flavor. I then decided to use them in a cooked dish, and came up with the dish you have here. 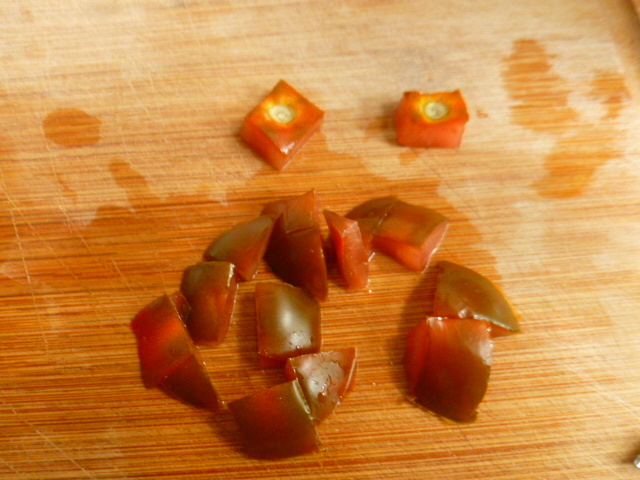 The tomatoes were very easy to scoop and stuff, and kept their shape nicely, though unfortunately, they lost most of their interesting color while cooking. 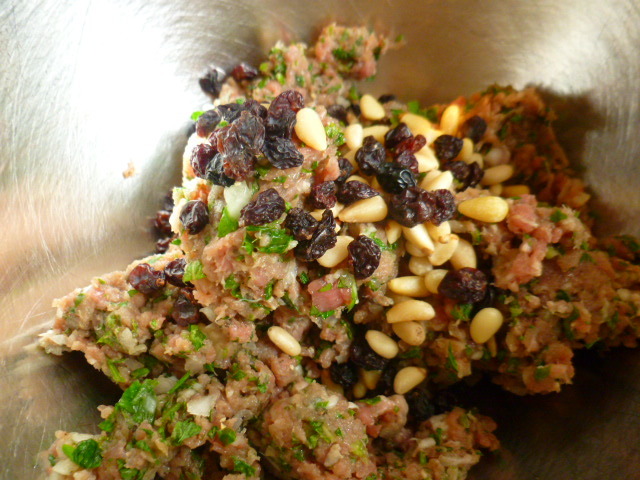 The stuffing, with fresh herbs, pine nuts and dried currants, complemented their sweetish flavor beautifully. 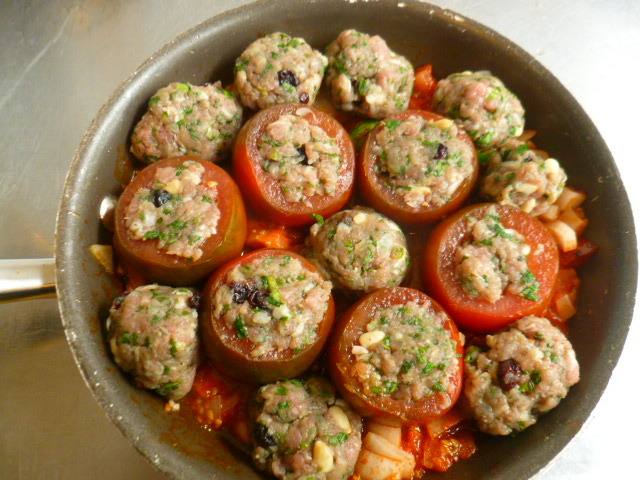 As I ended up with more stuffing than I could use with the few tomatoes I’ve had, I rolled the rest of it into small meatballs, and cooked them along with the stuffed tomatoes. The dish was tasty and hearty, though not heavy at all. Try it and enjoy. * If you can’t get Kumato tomatoes, any medium size firm tomatoes can be used instead. 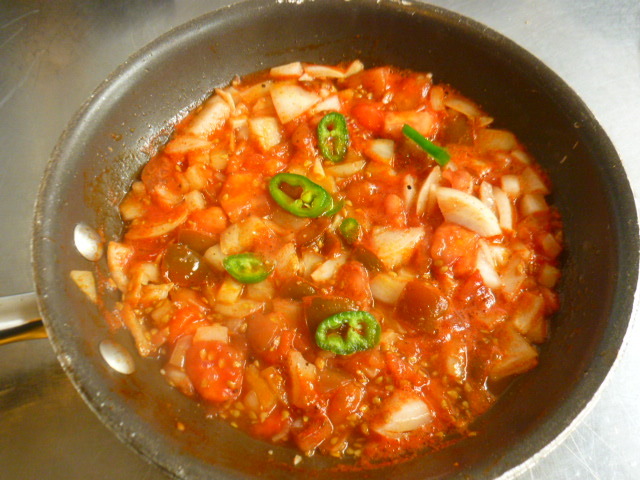 * Since the Kumato are not as acidic as most tomatoes, there was no need to add a bit of sugar to the sauce. However, if you use any other type, adjust the flavors accordingly. 1. 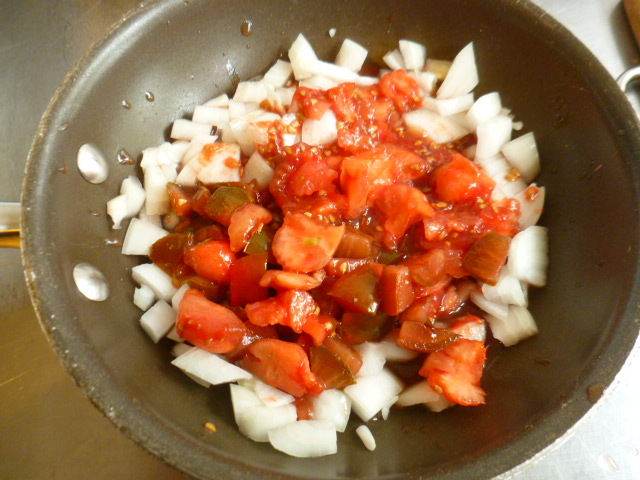 Cut off the tomatoes tops, and scoop out the pulp and seeds. Keep it for the sauce. 2. Chop half of the onion roughly, and place in a large pan. 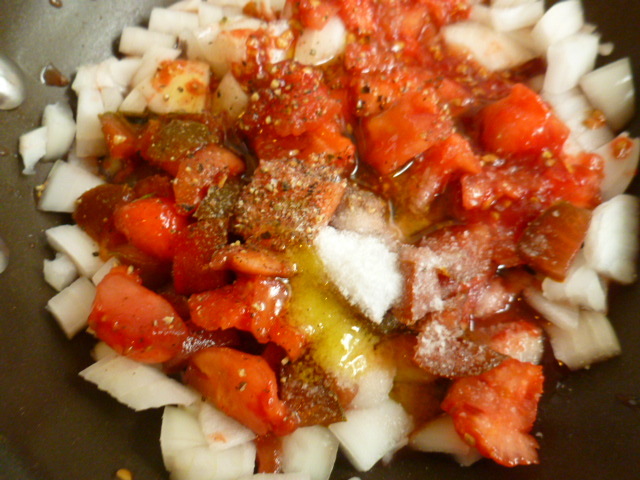 Add the tomatoes scrapes, olive oil, salt and pepper and mix. Place over medium-high heat and cook, mixing occasionally, for 10 minutes. Add the jalapeño and mix. Taste and adjust seasoning if needed. Keep in a warm place. 3. 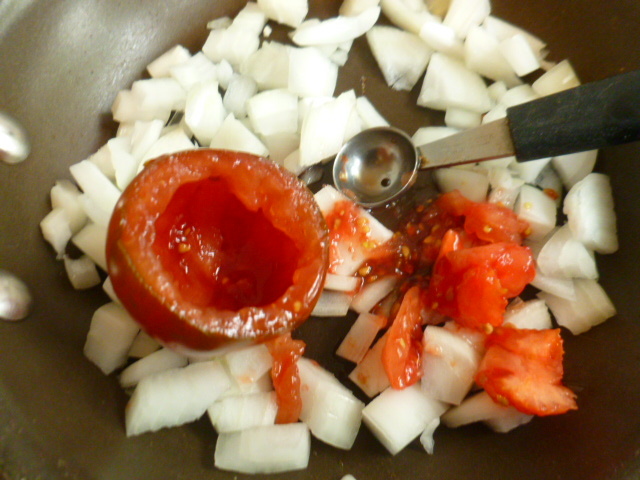 Place the remaining half onion in a small food processor, fitted with the metal blade. 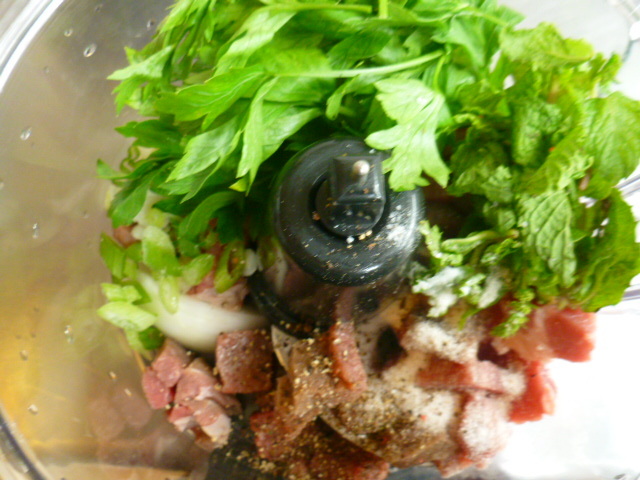 Add the meat, parsley, mint, salt, pepper, olive oil and bread crumbs and chop coarsely together. Transfer to a medium bowl, and add the pine nuts and dried currants. Mix well. 4. 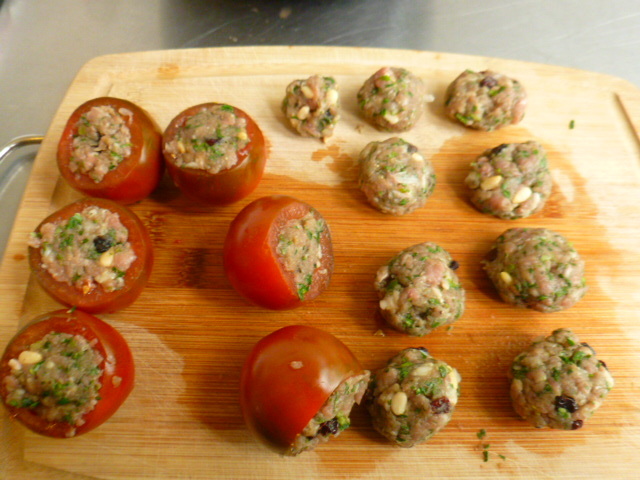 Stuff the tomatoes with half of the mixture, and create small meatballs with the rest. 5. 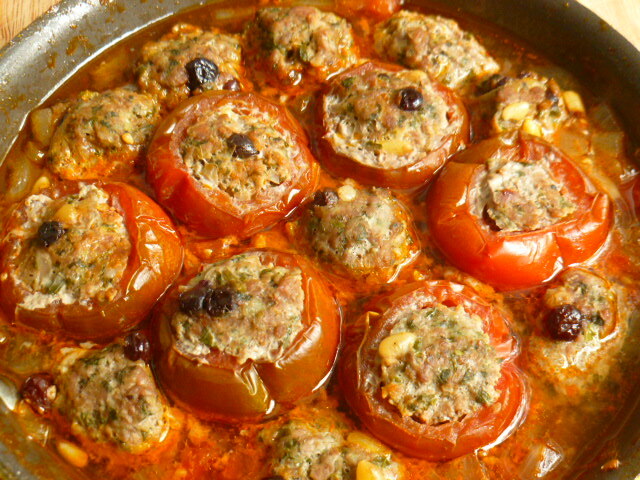 Place the stuffed tomatoes and meatballs on top of the sauce in the pan. Add the stock, cover the pan and place over medium-high heat. Bring to a boil, reduce the heat to medium, and cook for 15 minutes. 6. Meanwhile, preheat the oven to 250F (120C). Place the covered pan in it and braise for 40 minutes. Uncover the pan and place under the broiler for 2-3 minutes (if you don’t have a broiler, you can skip this step). Serve warm, with white rice. Looks delicious! I love tomatoes! Never thought to stuff them! That is a great idea! Try different stuffings! Looks great! Will have to think of an alternative for beef. Maybe peas? Thank you, I’m glad you liked the recipe. I never tried it with peas, but it’s definitely an option. I once made a vegetarian option by using a mix of fried onions, mushrooms and tofu, maybe it can work for you too. Another vegetarian option is using rice with vegetables. I tend to think of stuffed tomatoes as a bit old-fashioned. I absolutely love how you created a recipe that still has the feel of a comfort food, yet seems fresh and modern. Looks great! I love tomatoes! Hi Ronit! This looks and sounds delicious! Wow! Ronit, these are beautiful. 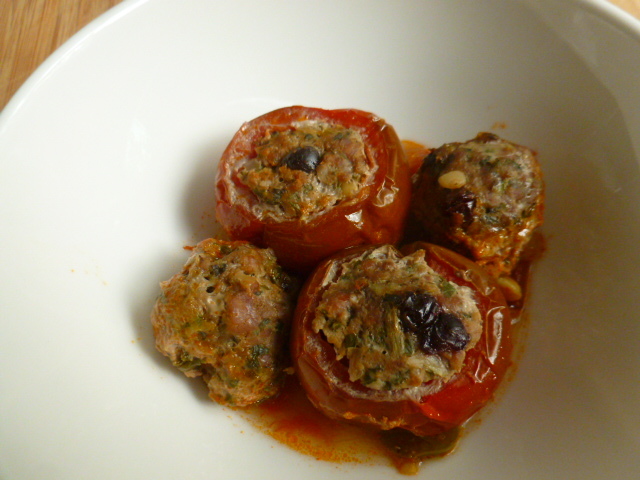 Sort of reminds me of a cross between baked tomatoes and dolma!! That’s a great filling! Ronit, I have seen Kumatos and their color attracted me but I never tried them. After reading your post, I am sure to try them. Love the idea of adding currants or dried fruit to make it interesting recipe and flavour. For another stuffing – I’d like to share my 80 yr. old mother’s recipe. ( boiled peas, rice and grated fresh coconut). Add necessary spice mix, chilli and salt. It used to be extremely popular at her ladies parties. Awesome! 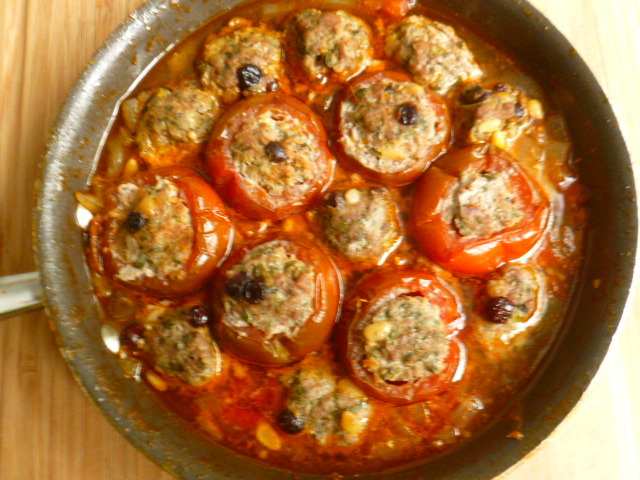 I would love to try the vegetarian version of stuffed tomatoes. Thank you Megala, I’m glad you liked the post. I hope to post a vegetarian version later on, but for now you can also check the following link, for tomatoes stuffed with cheeses. Oh, thanks a ton, going to check this out right now. This looks wonderfully tasty and what a great use of Kumato tomatoes. We get them from time to time in our market and I always get them when available. But I’ve never cooked with them. As they’re on the sweeter side you’ve got a perfect idea. A “must try” recipe as soon as I see them again in the market. Wow those tomatoes look so good. Thanks. Just lovely Ronit. Reading through the recipe, I had to be transported back to a post I put up when my mother in law passed away. She always loved making stuffed tomatoes. She made them with ground turkey or beef, but hers were without a gravy. I do make them from time to time, but it is quite labor intensive getting the tomatoes ready and cooking the meat separately. Love your recipe as well, will definitely have to give it a try. Mint, currents, pine nuts…this sounds like a very flavorful way to prepare tomatoes. Fantastic recipe Ronit – I saw Jamie Oliver do something similar on his new ‘cooking with Italian nonnas’ show….where he stuffed artichokes. Great recipe! Hi! I wanted to let you know that I have nominated you for the Sunshine Bloggers Award, which technically means you have received the award. If you choose to participate please find the directions at https://bakingintheburbs.net/2019/01/18/sunshine-blogger-award/ If you choose not to participate, that’s ok. I fully understand. I just want you to know how much I adore your blog! You deserve an award!Congratulations! Kumato is not obtainable here but I would like to try the recipe with sweet tomatoes in season.